Many months have passed since Denethor tasked his nephew Breged with the recovery of the ancient necklace known as The Nauglamír. 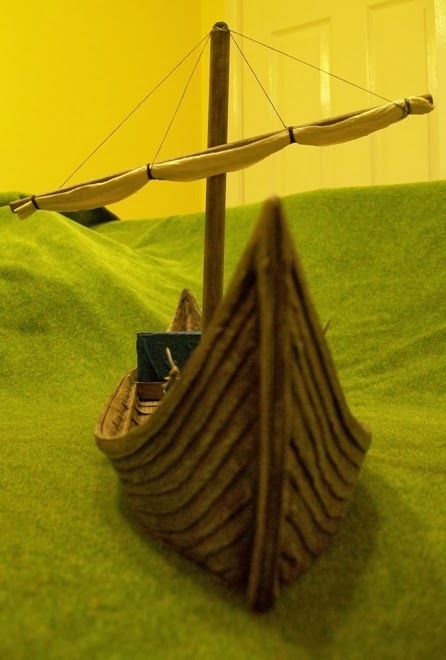 Since then, the shipwrights of Dol Amroth have been labouring away, building a ship tough enough to carry a determined group of adventures across the sea and back. They are nearly finished. With the days growing short, Breged has assembled his volunteers from the Tower Guard, but of the eight heroes his wish to recruit (not counting himself and Mandracoth), he has so far, only found five. 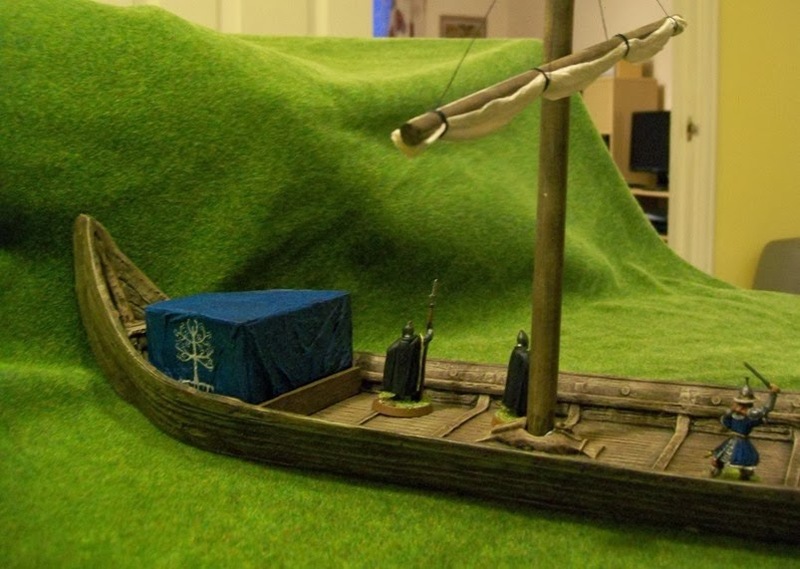 A few weeks ago, I received the body of the Glaurung in the form of a resin Viking ship from Gripping Beast. Since then, I have been doing a bit of painting and simple construction to try and make the ship look more like the Angus McBride ship on the cover of the Merp book Thieves of Tharbad. (See In TheShipyards of Dol Amroth). I started work by constructing the little cloth tent on the back of the ship. This is a non-permanent fixture that can be taken down if the ship enters combat. Most of the time, it will serve the double purpose of protecting the perishable supplies from the elements and giving Valetha, the sole female member of the crew, a small bit of privacy. The tent is made out of bits of card, measured to fit within the ship. I then covered the card with a paper towel soaked in a mixture of water and white glue, to try and give it the appearance of fabric. 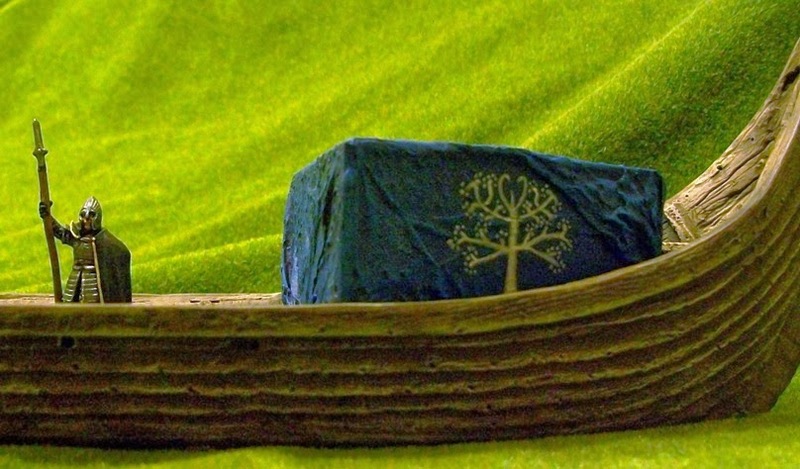 I painted it blue to give the ship a nice splash of colour and because it is the colour of Dol Amroth. It still seemed a bit plain, so I painted the White Tree of Gondor on either side. I’m pretty proud of this. I don’t consider myself much of a free-hand painter, but I think the trees came out rather nice. Having completed that, I painted the main body of the ship. This was a simple job of base coating it a deep brown and then dry brushing 3 or 4 lighter shades over it. Thankfully, the resin model had enough detail that the dry brushing gave really good results, and the painting proved really easy. The only non-wooden detail to pick out was the ironwork on the two hatches at either end, which I painted black. Originally, I had attended to leave the ship without a mast, as I thought it might interfere with play. However, the ship looked a bit naked without it, so I changed my mind. 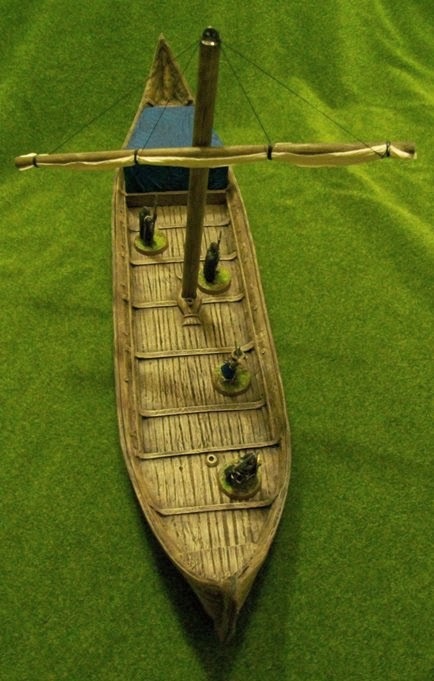 Using the Angus McBride ship as a guide, I built a simple mast and sail. The mast and crossbeam are doweling bought at an art store. 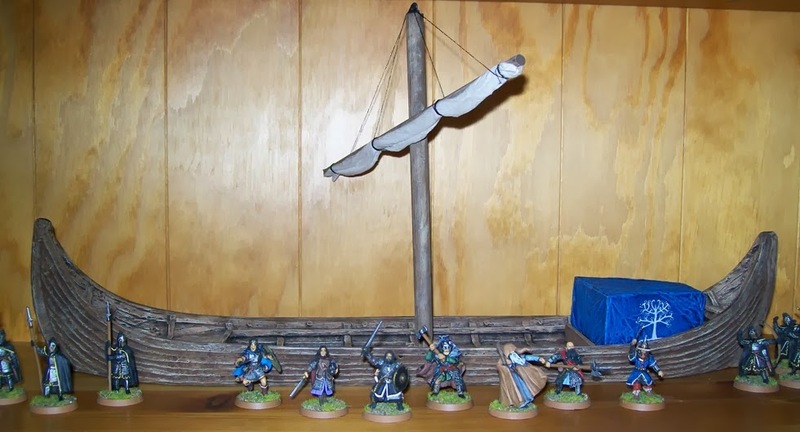 The height of the mast was measured so that the ship would fit into the shelf where I plan to keep it. I attached the crossbeam by drilling a whole in both it and the mast and using a bit of paperclip to pin them together for a stronger bond when glued. I spent a good deal of time wondering what to do with the top of the mast, as I wanted something to which I could connect rigging. In the end, I found a metal axe in my miniature bits that had a round blade with two holes in it. I think it is some kind of ancient design, but I can’t remember. I cut off the handle, filed down the back and glued it to the top of the mast with the blade sticking up and the two holes underneath. to create the sail, I cut a piece of paper towel, folded it back and forth into a thin line, then soaked it in tinted glue-water. After squeezing out most of the water, I attached the towel to the crossbar. I did this by simply wrapping black thread around it in four places and tying of the end of the thread around the axe-head atop the mast. A couple of drops of superglue ensured it should all stay put. Then, using my fingers, I pulled a little more shape out of the sail and left it to dry. I’ve got to say, the sail is the part of which I am most proud. 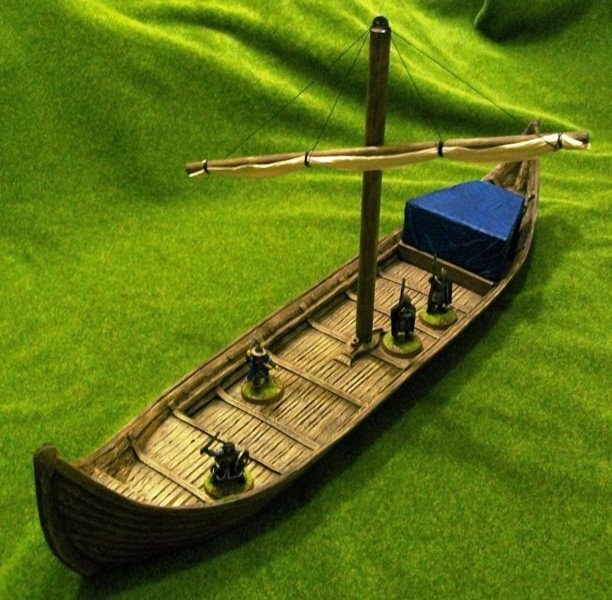 I wanted something that looked like the Angus McBride ship, but was quite simple with only a minimum of rigging. I think it looks great, but shouldn’t get in the way too much. That said, I have not actually attached the mast to the ship. I may at some future date, but for now, it stays put well enough with a little strategically placed blue tack. So, there she is, The Glaurung. I have been toying with the idea of adding a flag or banner streaming off the mast, but I might not. The ship proved extremely difficult to photograph. It’s just a little too large and awkward to get a good shot of the whole thing without including lots of household furniture. I took a lot of shots, but probably the best one for seeing the whole ship is the one of it sitting on the shelf. (Yes, my very understanding wife agreed to let me keep it on the bookshelf in the living room). I actually thought making the ship would be a pain. It was not. Starting with the great base from Gripping Beast, I only had to add a few simple additions, and I think I’ve got a great looking Glaurung. Now I just need to finish assembling the crew and get ready to sail. For the second time in as many weeks, Breged has overruled Mandracoth to accept a volunteer to join the crew of the Glaurung. At just nineteen, Galinor becomes by far the youngest member of the crew. For the past two years he has served in the coastal guard for his home city of Pelargir, and in that time has won laurels in both of the city’s Guard Tournaments for his skill in swordplay. Handsome, charismatic, and perhaps just a bit arrogant, Galinor is one of the city’s most popular sons. When news of Galinor’s acceptance reached the city, the Lord Castellan of Pelargir held a feast and presented Galinor with an ancient treasure from the city armoury, the Dragon Shield of Alenôth. Although Madracoth eventually relented in his arguments with Breged, he declared that no good would come from this decision. 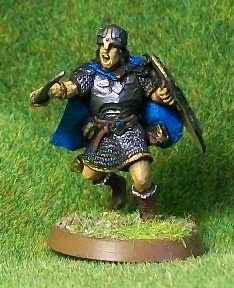 Galinor is the first of the heroes of the Glaurung not to be represented by a Lord of the Rings figure. 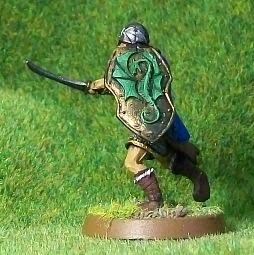 This resin figure is from MierceMiniatures and was apparently part of their recent kickstarter. It was given to me by a friend who had no use for it. Originally, I hadn’t intended to include a character like Galinor in the crew, but one must accept the unexpected on such long quests. 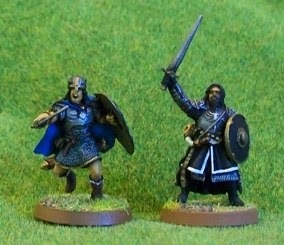 There aren’t that many miniature lines that fit well with the Games Workshp's Lord of the Rings range. Most figures are far too large and bulky, but this guy seem to fit right in well enough. The only thing I didn’t like about the figure was his sword, which was disproportionately huge. So, I cut it off and replaced it with the blade with Wargames Factory plastic orc sword. Thankfully, it glued on perfectly. 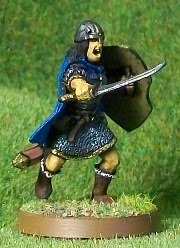 Careful examination of the figure shows that Galinor’s sword no longer matches his sheath, but I can live with that. I actually found the figure extremely difficult to paint as I just couldn’t see the detail in a lot of places. They just seemed to disappear under the spray primer. Still, I’m happy enough with the paint job. Happy enough to have him join the crew. A little less than three months after I came off my bike, breaking my left arm and wrist, I got back on. I probably could have managed it a couple of weeks ago, but the weather in Oxford has been so miserable, there haven’t been many decent opportunities. I just went for a quick, 3-mile spin around the neighbourhood, avoiding the spot of my last crash. I was a little jittery, and my wrist ached a bit from the bumps and gripping the handlebars, but generally, it felt great. 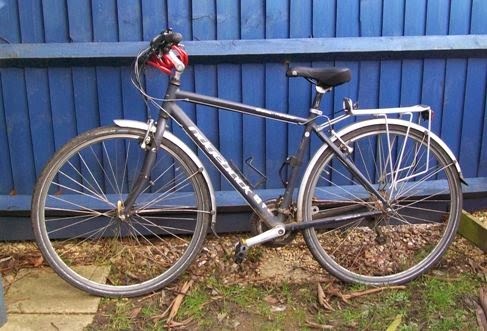 In light of my recent crash, as well as my crash a couple years ago which snapped my shoulder, I have named my bike ‘Bonebreaker’. I’m going to see if I can get a sticker or decal of the name, and a maybe three little bone stickers that I can put on the frame. Also, as I suited up to ride, I was surprised to discover that my reflective jacket had completely torn open down length of the zipper. I suppose it happened during the crash, but it's one of those things that you really don't notice at the time. I just heard that G. I. Joe is turning 50 this year. 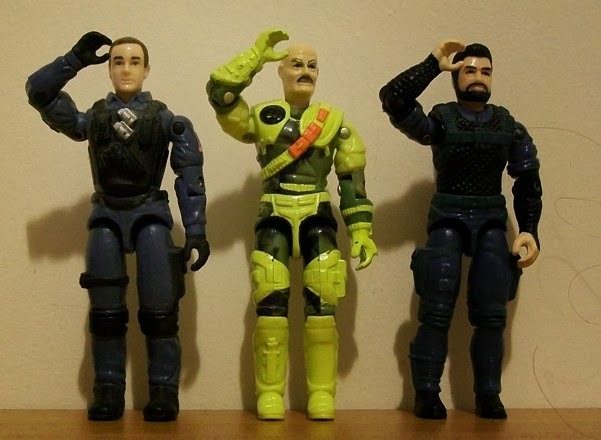 To my mind, the G. I. Joe: Real American Hero line that came out in the 1980s is the greatest set of action figures ever produced. They set a new standard for possibility that made Star Wars figures look pretty sad by comparison. Also unlike Star Wars figures (and many other lines), they could actually hold onto their guns. Most action figures produced these days are, by comparison, poorly sculpted and made of cheaper materials. I took a short break from my work on my Lord of the Rings figures to paint up this, rather cadaverous looking, Astropath for the forces of the Black Moab. 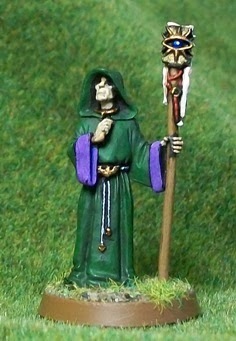 When I started painting the figure, I had visions of doing all kinds of free hand designs on his robes. I painted on a few, but decided that they were actually detracting from the figure rather than adding to it. So I painted over them and went with a very basic design instead. It is so unusual these days for Games Workshop to put out an understated 40K figure, it is nice to just go with it. This figure is part of one of the best packs of GW figures never to see general release. I already painted the other two figures in the pack, the Imperial Navy Officer and the Communications Specialist. Once again, this is a metal pack, and considering its limited release, it is doubtful GW will keep it around once the metal stocks are gone, so if you want one, don't wait long. 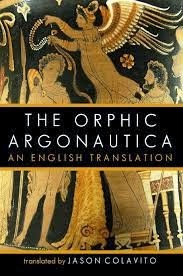 Jason Colavito’s book The Orphic Argonautica: An English Translation represents everything that is good about amateur scholarship and really is a must have for anyone with an interest in the story of Jason and the Argonauts. Not only does it provide a good, readable translation of the titular poem, but it also includes a couple of antique essays on the poem and several other fragments of ancient and medieval writings covering the tale of the Argonauts that would be difficult for most people to find on their own. I received my copy as a Christmas gift from my father and have just finished slowly reading through it. Although the poem is certainly a secondary source for the story, and probably not a great work poetry, it is still surprising to me that it has never before been published in a full English translation. For most of its short length, the poem follows the tale as put forward by Apollonius in his famous Argonautica, though with a greatly enhanced role for Orpheus, the supposed narrator. However, the poem does vary dramatically in the route of the Argo's homeward voyage, actually having the ship somehow sail up into the North Sea, down past Ireland, and back into the Mediterranean through the Straits of Gibraltar. Colavito accompanies his translation with just enough notes for the casual fan of Greek mythology to have a clear understanding of some of the more obscure references, and briefly covers the interesting history of the poem and the scholarly debate that has surrounded it. Considering the overall quality of the work, it is actually surprising that the work is self-published. Dead Man’s Chest was one of the last (322nd of 325) of the original Shadow pulp novels, and unfortunately, it is not one of the best. Although it has all the classic elements that make the series great, they are laid atop a confusing, weakly constructed mystery. The mystery mostly hangs on two, nearly identical, scenes in the first third of the novel, where the central character, in his search for lost gold, receives unnecessarily confusing clues from someone who is murdered during the interview. In fact, pretty much the only redeeming point of the novel, is a great action sequence in the New York City Maritime Museum, during which The Shadow swings off a chandelier to tackle some thugs on a balcony, then turns around and leaps back onto the chandelier on its back-swing to go after some others. It does also have a great cover from George Rozen, who painted most of the great covers.